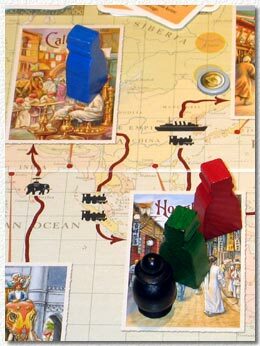 This game seems to be a merchandising product in the wake of the new "Around the world in 80 days" movie. Well, I don't care. It's the gameplay I'm interested in, and that's fine. The Kosmos of this game is difficult to explain (unless you use an advanced concept of space-time): In fact, players move in two dimensions. On the board, they move from city to city (London - Paris - Brindisi - ... - New York - London). The brim of the board features a Kramer bar but probably the only one I know where you wouldn't prefer to advance since it's the number of days spent. You start with zero and you'll end up with around 80 days. In order to travel from one city to another, you play cards. For London - Paris, you need a ship and a train, for example. Every card has a value in days. Accordingly, for London - Paris, you play a ship and a train, add the values of those two cards and advance that amount on the day bar. You don't want to play cards with huge values. Therefore, it can be a good idea to miss a turn, just to get new cards and hope for a better fare. It might happen that player A advances "quickly" in space, meaning he always hops from city to city and arrives in London... within 90 days... Player B might arrive two turns later, but he used lower cards and wins in the end. Imagine: Both started the same day in London, the first one experienced 90 days while the other only lived through, say, 72. Did you ever hear of Einstein's twin paradox? Back to the game. My description so far may have sounded complicated, but "80 Tage" is a really, really straightforward game. It's luck-driven, but it can be explained and played with four players in less than one hour (which we did). Players might complain that they don't have too many choices during their turns, but in fact, they do have some: At the beginning of a turn, you pick up one of the open transportation cards. Every card is linked to some other advantage (free event card, start player next round, ...) so you must ponder the cards and their values against those other advantages. Then, when you have two completely identical cards (e.g., two trains with value 6) and you have to use exactly this kind of transportation (e.g., two trains), you advance only half of the amount of days (i.e., 6 instead of 12). This means that card care is somewhat less primitive than it might seem at first glance. Then, the very first and the very last player to arrive at a city get another advantage (free event card, plus 1 day for all others...). So you can follow the tactic of always being last (but beware, as soon as the first player arrives in London, you lose 1 day per turn). I haven't mentioned all rules, but most. Winning the game is largely due to getting the right cards, but it is still fun. 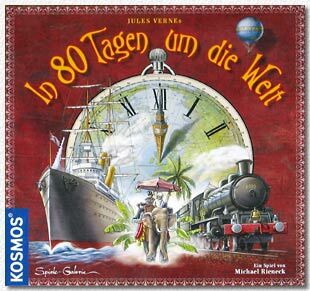 "In 80 Tagen um die Welt" is the kind of game you could play with non-players or children instead of stomaching Monopoly or Risk. It is luck-driven, it is true, but there you'll still find enough classic German game mechanisms.